Ahmadi houses are still empty. Even, some houses leave broken and miserable. The Jamiah Ahmadiyya of Indonesia’s building is also quiet and empty. All the students of Jamia leave their school and their dormitory. The mosque is also empty with no activity. No voice of call on prayers like usual for 5 times a day. No activities at the office at the basement of the mosque. Ahmadi members, as the owner get difficulties just come to visit the HQ. Almost everyday, one or two Ahmadis try to come to the Mubarak compound. Some of them take some equipments and others just seeing and checking the place. The gate to enter the HQ closed and the police check everyone or even Ahmadi members who come to the Markaz. They have to show an Identity card to the police if they want to enter the HQ and the police give them a very limited time. Recently, President Susilo Bambang Yudhoyono released a statement that government has officially banned Ahmadiyya through the attorney general. As an effect emerge a strict reaction from a number of figures to the statement. A joint press conference held to protest president. Several days before president gave that statement, Minister of People’s Welfare, Alwi Shihab also said that government denied MUI’s demand to ban Ahmadiyya. He gave the statement after ministrial meeting of politic affairs. To this, the government do not have a strong statement. President refers to what the attorney general, minister of religious affair and MUI’s fatwa on making the statement on Ahmadiyya. And he as a president of Indonesia does not look at what Indonesian constitution regarding freedom of faith. We also could see that Jemaat of Indonesia is really in danger. As an effect of the attacking of zealots to the HQ, a number of mosques in local Jemaat can not be used for congregational prayer, Friday sermon and other religious activities. The president gave a statement contrary to what Minister of People’s Welfare said. 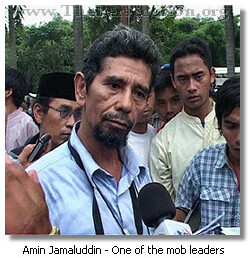 It is predicted that more violence will happen to Jemaat as an effect of President’s statement. Many local government still act upon themselves to ban Ahmadiyya in their respective regions. Following the MUI’s fatwa, the local government of Garut regency does not act properly as the central government has, on handling the Ahmadiyya case. They have already issued a Joint Resolution Letter to ban all the activities of Jemaat in the region. A number of local Jemaat in this area force to stop the activities and mosques of Jemaat prohibited to hold any religious activites. Heard that the head of local Jemaat of Pangauban, Garut regency threatened with a big knife to sign a letter containing that 72 members of Jemaat in Pangauban turning out from Jemaat. The member threatened not to tell anything about this tense situation to the press. And they, member of Jemaat can not go out from the area. Up to now, we haven’t heard the recent news of 72 member of Jemaat. The press is also threatened to come there to report this. In Tasikmalaya regency, following the fatwa of MUI, finally the government issued the Join Resolution Letter to ban Ahmadiyya’s Preaching outside and inside of Jemaat as well. The government reaches as its stances after some clerics and other mass anti Ahmadi force the local government of Tasikmalaya. The government also wants Ahmadi not to speak up to the press about what happen in the region regarding Ahmadiyya. Recently, Habib Rizieq head of FPI (one of anti-ahmadi fundamentalist movement) hold a “Tabligh Akbar” a big preaching to the Tasikmalaya community, he gave a statement regarding anti-Ahmadiyya. As an effect of this preaching create hatred to Jemaat among the mass. In Manislor, Kuningan about 8 mosques of Jemaat can not be used. The local government sealed the mosque as they’ve banned the Jemaat since 2003. It’s been 3 weeks the 8 mosques can not be used for praying. The security officer closes down the mosques. It is estimated that 3000 Ahmadis live in Manislor area. The ulema and local government often ask them to come out from Ahmadiyya’s belief and insulting the Ahmadi’s belief. Early of August 2005 Army (Babinsa) also involved with non government organizations made social communication (KOMSOS) by visiting members of Jamaat Manislor. Visit is done every day. Door to door or gathering several families at one place. Members response : their problem is told to all. In our opinion, the visit is for intimidation and changing faith. On 12 August 2005, volley ball team of khuddam and lajnah Manislor were invited by District Army (Kodim) for friendship game placed at Kodim Kuningan Center. For security, situation get better and still be careful. And from government apparatus their selves now are more neutral after the news from Jakarta Post. For tarbiyat : local office bearers arranged the schedule imam Jum’at prayers in the certain places. Khuddam and Lajnah have been meeting with students (Junior and Senior High Schools) every week at SMP Amal Bakti Building as anticipation. Because the student are intimidated by their teachers and friends about Jamaat. On 27 August 2005, President SBY will visit Linggarjati Building Kuningan. But we don’t know for what purpose. 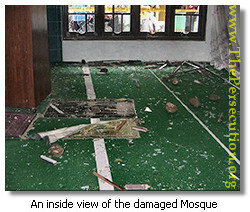 Jamaat Sadasari mosque was destroyed by mass, window broken, this act was done by the mass from Sadasari and out sides. Majalengka District Government will issue Join Resolution Letter (SKB) to prohibit Jamaat in Majalengka. Jamaat is prohibited to do every activity. Houses are prohibited for Jum’at prayers places. They have to join with other society to do activity such as Jum’at prayers. If they are not done, the assets will be destroyed. After attacking, the Chief of Majalengka District came to visit Sadasari as reported by Indo Pos News Paper. According to Mansyur, chief of Sadasari village, he doesn’t agree with anarchy actions. The local MUI (Indonesian Ulema Council) together with the head of police officer force government to stop Ahmadiyya acitivities in Cimahi regency. They refer to the fatwa of MUI that Ahmadiyya deviate from Islam. The government want Ahmadi members hold prayers at their home, as they prohibited to hold a prayer in Ahmadi mosque. Mosque can not be used in Bunijaya Village. In Cisarua mosque can not be used for Friday prayers. In Cianjur, the government has also banned the teaching of Ahmadiyya. Terror and intimidation happened to Jemaat of Ciandam, Cianjur area that they, mass anti Ahmadi will attack Ahmadi mosque. They also warn Ahmadis in the area not to hold any activities. Local government had not prohibited Jamaat, one mosque was destroyed in Talaga Village. The mosque of Jemaat in Cisalada, West Java closed by local police officer as a follow up of fatwa MUI that is not a legal binding in Indonesia. The police place a police line around the mosque. Ahmadis in Cisalada area could not perform their congregational prayers and other religious activities, even they live side by side around the mosque. The local government in the area has prohibited Ahmadiyya by issuing a Join Resolution Letter signed by local authorities. They do not want Ahmadiyya exist in the region. After SKB Bogor, all of mosques Jamaat Bogor were closed (Ciaruteun, Leuwisadeng, Cimayang, Sindang Barang), except Bogor City and Ciherang. In Ciaruteun the mosque has broken down as an effect of attacking in Markaz. The mass anti ahmadi threw big stones to mosques damaging the door, roof, wall and damaging inside the mosque. By calling “Alloh-u-Akbar! !”, they throw stones, wood and other heavy things to the mosque. It happened at night, so that no one could recognize who they were. The police line place around the mosque and no one is arrested as a suspect of the incident. In Bekasi regency, Habib Rizieq, Ahmad Hariadi, Amin Djamaludin and other Ahmadies opponents preach the society on anti-Ahmadies and slander the Jemaat. It creates hatred and anti-ahmadi sentiment on the society. A few days after they preached, a big demonstration of anti-Ahmadi hold in the city of Bekasi, they demand the local government to ban Ahmadiyya immediately and they, hundreds of demonstrators do not want Ahmadiyya exist in Bekasi. A number of mass anti-Ahmadi come to Ahmadi mosque at Central Jakarta and held a demonstration two weeks after attacking incident in Markaz. Abdurrahman bin Ismail led the mass anti Ahmadi. They could not enter the mosque as it was locked and seem empty. They force government to ban Ahmadiyya and close the mosque. They place a banner slandering Jemaat. The mosque can not be used for Friday sermon, congregational prayers and other religious activities. In Tangerang, the local government ask to member of Ahmadi to close the mosque and stop any activities. They also ask to put down the sign boards of Ahmadiyya. As an effect Ahmadi members could not perform Friday Sermon, congregational prayers and other religious activities. The request came from the chief of village group who then request insisting from local government. On Sunday (21/8) placed in Agung Mosque Cirebon tabligh akbar was made. It’s started at 13.30 hrs West Indonesia Time attended by 200 persons. The themes were “Apostasy in IAIN (Islamic Government Institute)” and “Why Ahmadiyah Misguided?” with speakers Ust. Hartono Ahmad J, Ust. Muhamad Toharo, and Yusup Utsman B from LPPI. Before speaking, both committee and speakers said the participants that they did not mean to make provocation but only gave information about the themes. First theme is “Apostasy in IAIN”, they develop theme and said there are persons in IAIN (working in IAIN) and support Ahmadiyah any among them : Abdul Muksit Gojali, Gusdur, Abdul Malik, Dawam Raharjo, Muslim Abdur Rahman, Safi’I Anwar, Safi’I Ma’arif, Amin Rais. They said as apostasy because they rejected MUI fatwa and support Ahmadiyah. Second theme is “Why Ahmadiyah Misguided” based on MUI fatwa of 7th National Meeting in Jakarta. This theme was delivered by Ust. Hartono Ahmad J about biography of Hz. Mirza Ghulam Ahmad and they took reference from Tazkirah which they said as the holy book of Ahmadiyah. Any among them they said,“On page 402, who don’t believe Hz. Mirza Ghulam Ahmad they don’t believe in God and Messenger.” And on page 163,“Some one who don’t believe Hz. Mirza Ghulam Ahmad as nabi and rasul is disbeliver (kafir).” They also think how possible a messenger of Allah died in humiliation, they said Hz. Ghulam Ahmad died in the toilet because he was sick that died in toilet. They also discuss some quotation from Tazkirah by showing Tazkirah. 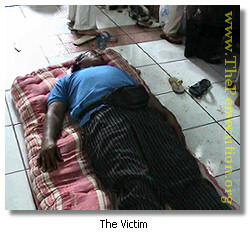 By the grace of Allah, Jamaat condition in East Java Area relatively is conducive. 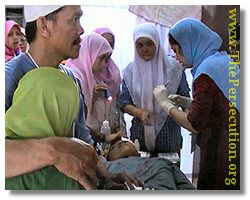 We had done social activities such as blood donor by 31 persons, on 17 August 2005 and published by ANTV television station. Radio El Shinta and Radio Suara Surabaya also published our activities, the essence is that we do activities on Indonesia Independence Day occasion and thank to Allah for Jamaat Ahmadiyah in East Java condition. The other activity is cooperation with Bangsa daily news paper belong to PKB that published the books of Hadhrat Mirza Ghulam Ahmad a.s. They had published Jamaat books three days continuously. But we need to pay special attention that on Friday the first week of August 2005, one of mosques belong to Majlis Mujahidin Indonesia (MMI), they gave provocative sermon to attack Jamaat. We had made coordination with South Surabaya Police and Garda Bangsa Troop belong to Gusdur. And it was really that several days after that anti Ahmadiyah group namely MMI made oration in front of Tabligh Akbar Forum near the mosque of Jamaat which was guarded by Garda Bangsa. Fortunately they didn’t mention Ahmadiyah. There was an interested incident that one of MMI activists interviewed by JTV journalist and he provoked Gus Dur, and it was blown up by JTV and got hard reaction from Garda Bangsa until the activist apologized Gus Dur. At last MUI exponent namely MMI have no place in the hearts of East Java people. 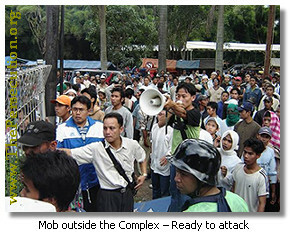 Those changed MUI attacking ways with approach the number of Islamic traditional school and cleric (kyai) from among nahdiyin (NU organization), namely made demonstration at strategic places in Surabaya City and mass media in East Java with contains to support MUI fatwa and considered Ahmadiyah misguided. Some message from us so that tried by Sadr to contact Mr. Imam Nahromi. He is Garda Bangsa officer who lived in Jakarta and also ask him about Gus Dur statement to support Ahmadiyah. And we also report our next activity to visit Mr. Ali Maksum Musa house on 23 August 2005. Insya Allah. He is chief of NU in East Java Province. And any other local Jemaat in every part of Indonesia, specially outside of Java island. They are being threatened by mass anti Ahmadi and push the local government to ban Ahmadiyya. In North Sumatera, some anti-Ahmadi clerics together with local MUI hold a seminar regarding anti-Ahmadiyya teaching. In the seminar, they push the local government of North Sumatera to ban Ahmadiyya and its activities. In Padang, West Sumatera, it’s still heard that the local government banned the Ahmadiyya teaching. The action on banning the Ahmadiyya’s activities is really against the human right. As a matter of anti-Ahmadis opponents’ action, we’re lost the right to believe in our-own faith, the right to express our-own opinion and to speak up to the public as happen in Jemaat of Garut and Tasikmalaya region, and even the right to live in our own home as happen to Ahmadis in Markaz. It’s really a sad story not only for Ahmadi members but also for the whole human race. Join Resolution Letter had been issued for Tasikmalaya District and Municipality, and Garut District. But Jamaat activities still take place as usual. Only many activities that involved many members of Jamaat had been reduced. There are endeavors to force members of Jamaat Pangauban, Garut so that they sign the statement to out of Jamaat. With the sharp weapon they intimidate President of Jamaat local to sign the letter as representative of 72 Jamaat Pangauban members.